Amy Plum, internationally bestselling author of the Die for Me series, delivers a heart-pounding adventure perfect for fans of Michael Grant, Veronica Rossi, and Alexandra Bracken. 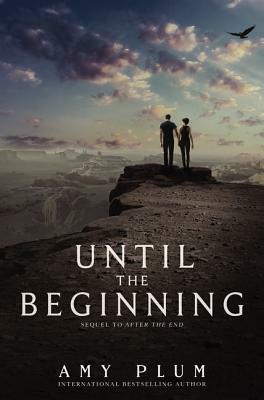 Until the Beginning is the sequel to After the End, which Marie Lu, New York Times bestselling author of the Legend series and the Young Elites series, called "wonderfully riveting." In this stunning and exhilarating conclusion to the duology, Juneau has been searching for her people and for answers ...and she is about to find both. When Juneau's clan disappeared, she lost so much more than her friends and family. She soon discovered everything she thought she knew about her life was a lie. Her people's gifts were actually secret abilities that others wanted, desperately enough to kidnap an entire village. Juneau set off on a cross-country journey with her new companion, Miles, to find her clan, which led them to a game preserve in New Mexico. Now Juneau's people are finally within reach, and she will stop at nothing to save them. But she has a target on her back too, because unbeknownst to her she is the key to unlocking everything. To rescue her people-and herself-Juneau must discover what she and her abilities are truly capable of. "I have had a powerful weapon at my fingertips my whole life, but I'm finally learning to wield it. I feel unstoppable." When Juneau's clan disappeared, she lost more than her friends and family; she lost her entire world. She discovered her life was a lie--her people weren't living in the wilderness because they were the sole survivors of a nuclear war. They were in hiding, hoping no one would find them and learn their secret: they never get sick, they hardly age, and they have the power to communicate with nature. Juneau is closer than ever to finding them, and she couldn't have gotten this far without Miles. Although he originally pursued her with the goal of turning her over to his father, he has become her greatest ally. Even as an outsider, Miles has helped Juneau realize she is far more powerful than she'd ever believed. But now the same people who took Juneau's clan are after her too. Somehow she is the key to unlocking the mystery of her people's gifts. To rescue her clan and protect their secrets, Juneau must push past the boundaries of what she was taught, to discover what she is truly capable of. Amy Plum is the international bestselling author of After the End and the Die for Me series. She spent her childhood in Birmingham, Alabama, her twenties in Chicago and Paris, and several more years in London, New York, and the Loire Valley. Now she lives in Paris and swears she'll never move again.